According to the latest rumours, Telstra will soon released a 4G capable version of Samsung's Galaxy S II smartphone. • Just how fast is the HTC Velocity 4G? Local blog Ausdroid first reported on the Galaxy S II 4G smartphone in early February. Citing a source "in-the-know for Telstra news", it claimed Telstra was planning to launch the Galaxy S II 4G and the Galaxy Note in the near future. The rumours quickly gained further traction in recent weeks — since the original piece was published, the Galaxy S II 4G has appeared in Telstra's internal system, while a photo of a reported dummy model of the phone that will be used in Telstra's stores was sent to Gizmodo Australia by an anonymous Telstra shop employee. 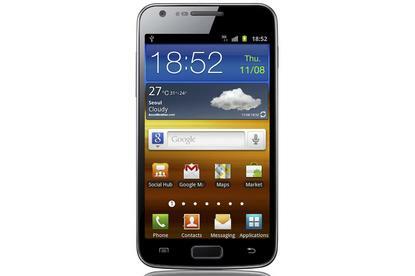 A Telstra Samsung Galaxy S II 4G is likely to be a variant of the Galaxy S II LTE, which is what the phone is known by in other markets. It is a very similar phone to the original Galaxy S II, but it has a slightly faster 1.5GHz dual-core processor and a bigger 4.5in screen, albeit with the same 800x480 resolution as the original. The Galaxy S II 4G will also have a slightly larger battery in order to cater for the extra juice that Telstra's 4G network will use. Alternatively, Telstra's version of the Galaxy S II 4G could very well be a variant of the Galaxy S II HD LTE, which is currently a South Korean handset. This model also has a 4.5in display but at a higher, HD resolution of 1280x720 pixels, the same as Samsung's Galaxy Nexus. It will be particularly interesting to see if the Galaxy S II 4G uses dual-channel HSPA+ technology like the Velocity 4G does: this would make it faster than most other smartphones on the market even when outside a 4G coverage zone. Unlike other "4G" networks in the world, the 4G network used by Telstra is best described as an LTE enablement of its Next G network. It runs on the LTE 1800MHz network band but "switches across" to the Next G network when 4G coverage is not available. The Samsung Galaxy S II 4G would become just the third product to work on Telstra's 4G network: the telco released the 4G USB modem in October last year and then followed that up with the Velocity 4G last month.